Ordinarily I wouldn't dare to say that political leaders have anything to learn from Jesuits. People in public life can read their craft far better than outsiders. But these are the kind of extraordinary times of anxiety and flux that led ancient rulers to consult oracles, read tea leaves and look carefully at the flight of birds. People fret because their future and their pockets rise and fall on the tide of of would-be presidents. Candidates for office throughout the world quickly see their popularity fall to 20 per cent or so as they try to catch the popular wind and throw asylum seekers and other expendable people overboard. Commentators neglect the larger public good to fix on politics as politics. In this sour slurry of discontent and puzzlement the Jesuit election as Superior General of a Venezuelan political scientist may provide material for broader reflection. Arturo Sosa was born and spent most of his life working in Venezuela in one of the few democratic gaps between military and oligarchic rule. He was brought up in a Catholic Church that, like the people, had been crushed by authoritarian regimes. He knew the value and the costs of democracy. He became a Jesuit in the late 1960s, a time of ferment in the Catholic Church, and was able to combine his studies in a secular university with experience of and reflection on the life of the poor in a Jesuit social institute. He was able to explore what mattered in his faith, his personal life and in Venezuelan society. After he was ordained as a priest he worked for many years in a pastoral institute and university in a regional city. He was engaged in helping educate the poor and in forming Catholic leaders and communities with a strong social conscience. He developed the habit of reflecting on policies from the point of view of those affected by them. These gifts and skills were important when he was made the Superior of the Venezuelan Jesuits. He deplored the situation in Venezuela, a country rich in oil but where the wealth had gone disproportionately to the few and which was marked by corruption. Popular disaffection with the government led to the election of Hugo Chavez, a former military officer. "Sosa's path to leadership may be of wider interest, not because he would be a good head of state, but because of the large threads that run through his life. They suggest qualities that we should ask for in our national leaders." Sosa, who wrote many books on the Venezuelan public life, saw that Chavez brought a military approach to the democratic deficit in the nation. In his time in office Sosa was prudent in dealing with a capricious government. He also brought together the Venezuelan Jesuits to plan their future directions of the Province, and name its priorities, especially its service to the most vulnerable. He had a democratic vision, and was able to listen and to negotiate with people with whom he disagreed. Later Sosa led a Jesuit university in an impoverished region on the Colombian border. The university was supported by and complemented many other ministries working directly with the poor in the area. His understanding of Venezuela was built on a feeling for the political periphery. Three years ago Sosa was called to Rome to take responsibility for the major educational and Jesuit formation institutions there. Working in a government town, whether Rome or Canberra, is demanding. Once again his ability to listen and spend time in conversation helped him make the organisational changes he thought necessary. He had little taste for the politics as politics that is the besetting temptation of participants and players in government towns. Arturo Sosa's path to leadership may be of wider interest, not because he would be a good head of state, but because of the large threads that run through his life. They suggest qualities that we should ask for in our national leaders. He has evidently shown a sure grasp of what matters in which his personal convictions and a reflective reading of the broader public context are integrated. This has given him the sureness that enables him to listen to and enjoy the company of people with whose ideas he disagrees. He also instinctively views governance and policy from the perspective of those affected by it, particularly those most disadvantaged. In Catholic and Jesuit terms this reflects itself in a collaborative view of ministry in which the difference in power between clerical and lay is minimised, and shared responsibility emphasised. In terms of national life it expresses itself in seeking familiarity with marginal regions and with marginalised people in them. Finally, he has experienced the corruption of democracy, the threats to it, and the practices that build it at each level of society. He does not spend its capital lightly. Even given the differences between the relationships involved in governing a nation and those involved in personal and institutional leadership, we should surely expect of our political leaders a grasp of what matters in the nation and personal commitment to it, a familiarity with their people, especially the most vulnerable, and instinct and skills for collaboration rather than conflict. Whether we learn this lesson from a Jesuit or from tea leaves, it is still worth attending to. Fr Arturo Sosa SJ (pictured above right, with his predecessor Fr Adolfo Nicolás SJ) was elected Superior General (international leader) of the Society of Jesus on 14 October 2016. Read an extensive interview with Sosa here. Fr Arturo Sosa SJ sounds like a man for others, Father Andy. Fr.Sosa's election gives us wonderful reassurance that the direction Pedro Arrupe gave to the modern Society of Jesus, a commitment to 'the faith that does justice', will continue to motivate it. Thank you for this brief introduction to the new leader of the Jesuits. Somehow I believe he will be running as a deputy to the number one Jesuit in Rome or rather the Vatican! That said, your final paragraph lists three qualities that our political leaders certainly would subscribe to. My concern is that many appear to either lack "a grasp of what matters most" or are running scared of declaring it given the 24 hour news cycle and their inability to educate an electorate in 30 second TV grabs. I think it was St John XXIII who said that good doctrine doesn't have to be imposed because it's logic is so clear that people embrace it. We need politicians who can educate and lead this nation to prioritise the most vulnerable including those we have caused to be on Manus and Nauru. Sadly I see no "road to Damascus" events from our political leaders on this issue. South Americans appear to be the flavour of the month in the current Church. 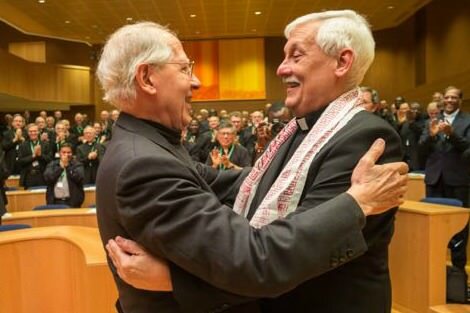 Fr Sosa seems to be well within the norm as the Jesuit General. Hopefully, one day, the Society will choose its leader from its largest Province: India. Indian Christians are still discriminated against and persecuted. This may not be 'official', but, in some areas it does exist. I am talking about normal Catholic Christians going about their everyday lives. The Jesuits exist among the Latin Rite Christians, many, but not all, of Goanese origin. Xavier was there: his influence is palpable. It would be a more than token gesture. Indian Jesuits are superb. They have something to give. The Universal Church needs it. Not to cavil about an otherwise thoughtful post, Edward; but the term 'Goanese' is commonly regarded as of pejorative use by uppity Anglo-Indians and colonial Europeans, who at one time generally benefitted, even within the Church, by a pecking order that discouraged the leadership potential of nativist clergy. The correct term is 'Goan' or 'Goans'. Well more power to Atturo's elbow. Were I to be making a plea on behalf of Australian it would be to his "reflecting on policies from the point of view of those affected by them" in this case the Australians traduced by ex-students of Jesuit schools masters of neo-liberalism. Those places now, as they trade on the Jesuit brand need extra resources for their managers so as to avoid becoming prisoners of the privileged, the entitled parents who hold the schools in thrall like Stockholm syndrome playthings. Often these people know little about education or adult theology. Schools will need extra help with their civil,spiritual and moral courage to refuse that extra swimming pool, rowing club or gymnasium as a practical example of customer selection and brand management. That is if Arturo is going to use any significant criteria for franchisees of the S.J. brand. Obviously "Being a good Catholic" is not enough. With all institutions taking part, this scheme will succeed and it will deliver fair, consistent and generous redress for survivors. If some institutions don't take part it will be yet another blow to abuse survivors, with some reaping the scheme's benefits while others are left to suffer further defeats and humiliations. A case in point is the South Australian government. Before the ink was dry on the announcement, SA had already indicated it would not take part. This is appalling, whatever the justification.